In 1947, as the people of Great Britain were rebuilding their lives after the devastation of World War II, a Royal celebration heralded nationwide rejoicing throughout the Commonwealth. 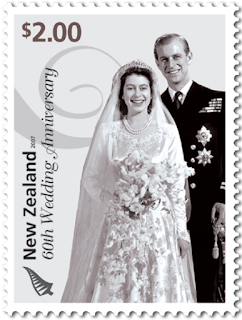 On 20 November, Princess Elizabeth Alexandra Mary (the elder daughter of King George VI, and soon to be Her Majesty Queen Elizabeth II) married the Duke of Edinburgh – an occasion we remembered in New Zealand as the couple celebrated their diamond wedding anniversary. 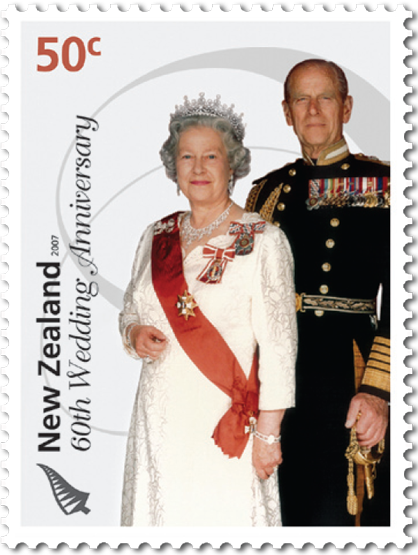 New Zealand Post released this two value stamp issue commemorating this momentous milestone for New Zealand's Head of State. 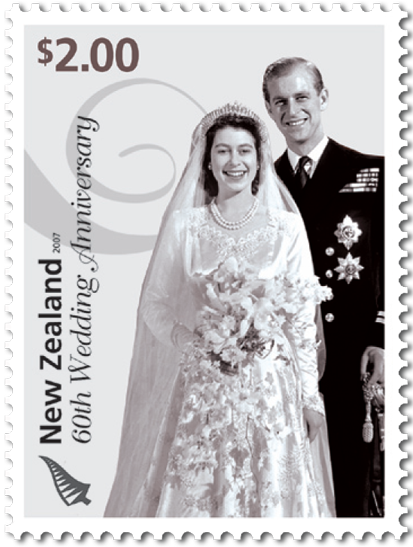 For not only was it a personal achievement for the couple, but Her Majesty Queen Elizabeth II, the 40th monarch since William the Conqueror obtained the crown of England in 1066, was the first reigning sovereign to reach a 60th wedding anniversary. 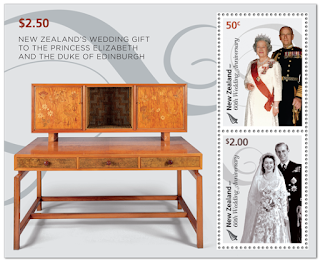 Included in this issue were a miniature sheet and two first day covers. Single $2.00 'Wedding Day 1947' gummed stamp. You can see the dress in all its glory in this photograph taken on the wedding day. Designed by Court Dressmaker Norman Hartnell, the ivory silk gown was decorated with crystals and 10,000 seed pearls, with a four-metre train inspired by Botticelli’s figure of Primavera, symbolising rebirth and growth after the war. The Princess’s tiara was originally made for her grandmother, while her pearl necklaces reportedly belonged to Queen Anne and Queen Caroline (the consort of George II). The Prince wore a military uniform in keeping with Royal tradition. Single 50c 'Official NZ Joint Portrait' gummed stamp. 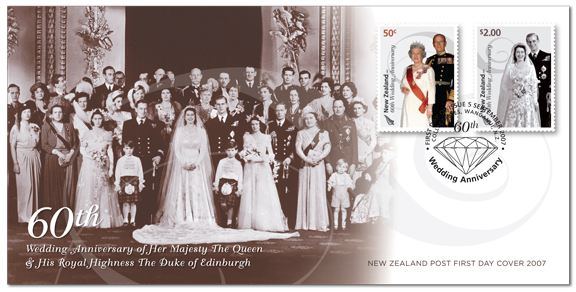 In Britain, the 2007 diamond wedding anniversary celebrations included a special exhibition at Buckingham Place – one that recreated the wedding day, with archive film footage of both the celebrations and the behind-the-scenes preparations. The exhibition also, for the first time since 1947, brought together the clothes worn by the main members of the wedding party – including Princess Elizabeth’s magnificent dress and jewellery. First Day Cover - 5 September 2007. Miniature Sheet First Day Cover - 5 September 2007. Miniature Sheet with one 50c and one $2 stamp. 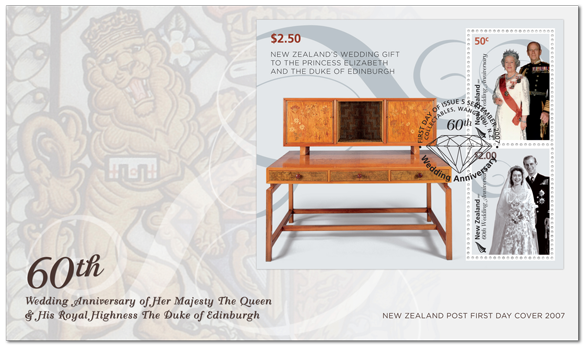 The writing desk was presented to the royal couple as a wedding gift on behalf of New Zealand. 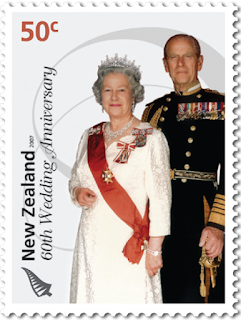 Date of issue: 5 September 2007. Number of stamps: Two gummed stamps. 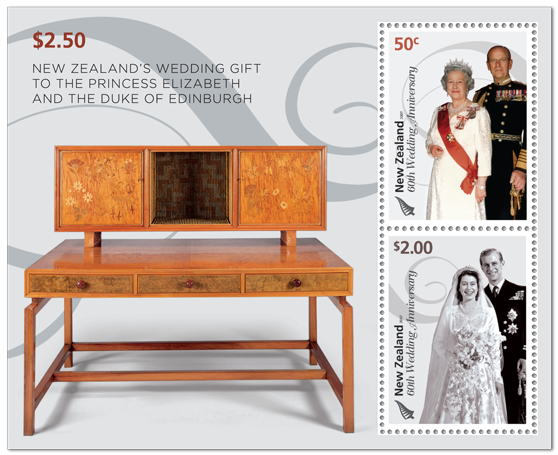 Stamps and first day cover designed by: Communication Arts, Wellington. Printer and process: Southern Colour Print, by offset lithography. Paper type: Tullis Russell 104 gsm red phosphor stamp paper. Stamp size and format: 30mm x 40mm. Special blocks: Plate/imprint blocks could be obtained by purchasing at least six stamps for a sheet. Barcode blocks were available in both A and B formats. Period of sale: These stamps remained on sale until 4 September 2008.